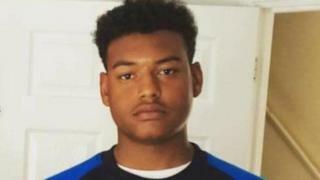 Two men and a teenager have been found guilty of murdering a 17-year-old boy. Tavis Spencer-Aitkens was stabbed 15 times and hit over the head with a glass bottle on 2 June in Ipswich. Aristote Yenge and Adebayo Amusa were convicted at Ipswich Crown Court with Kyreis Davies, 17, who can be named after the judge lifted a court order. Callum Plaats was found not guilty of murder, but convicted of manslaughter. Leon Glasgow was acquitted of both murder and manslaughter. The jury is still considering its verdict on Isaac Calver, who denies murder, and has been sent home for the night. Yenge, 23, and Davies had refused to attend court so were absent when the verdicts were returned. In the packed public gallery, Tavis's mum cried when they were found guilty. She walked out when the verdict on Plaats, 23, came back and there were gasps when Mr Glasgow was cleared. The reporting restriction on naming Davies was lifted following an application by the BBC. During the three-month trial, the jury heard Tavis was killed in revenge for trouble that flared between two rival gangs. The court heard Tavis was friends with a group which called themselves Neno or The Three - after the IP3 postcode of Ipswich. His attackers were from a gang known as J-Block. The court had heard how 20-year-old Amusa's DNA was found on the neck of the unopened bottle of alcohol used in the attack. Yenge, of no fixed abode, Amusa, of Barking in east London, Davies, from Colchester, and Plaats, of Ipswich, will be sentenced at a later date.